The Trinidad & Tobago Blind Welfare Association has a commitment to assist blind and visually impaired in coping with the problems that result from limited vision, failing vision and total blindness. We are a non-profit, voluntary rehabilitation organization that receives funding from private contributions, bequets, deeds of covenant, annual financial campaigns and from government. There are three Workshops which are attached to the Association's Branches. 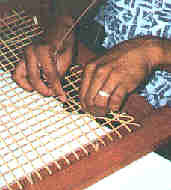 Various crafts in basketry, chair caning, and seagrassing are manufactured. Many crafts are thought to Blind students including that of furniture building. Those of the Blind who are unemployed have a chance to display their works of art at each of the Association's showrooms.